Horrors of the Warp is being released tomorrow and we know you're excited just as we are! But before we get to our last Chaos God diary, let's start with an announcement: the humble servant of the Imperium, Chapter Master Valrak himself, is going to face the Daemonic hordes of Chaos live on Twitch tomorrow at 8 pm CEST on his Twitch channel! Now let's get to our last Chaos entry... who is left, of the big four? Nurgle, of course. The Plague God, the Lord of Decay, good old Grandfather Nurgle! Plaguebearers are the rank and file of Nurgle's legions. These loathsome Lesser Daemons are crafted from the blighted soul-stuff of mortals who have been slain by Nurgle's Rot. A Plaguebearer carries the marks of Nurgle's Rot through eternity. What little of its skin that can be seen beneath the discharge of innumerable sores tinged with suppurant greens and vile browns. 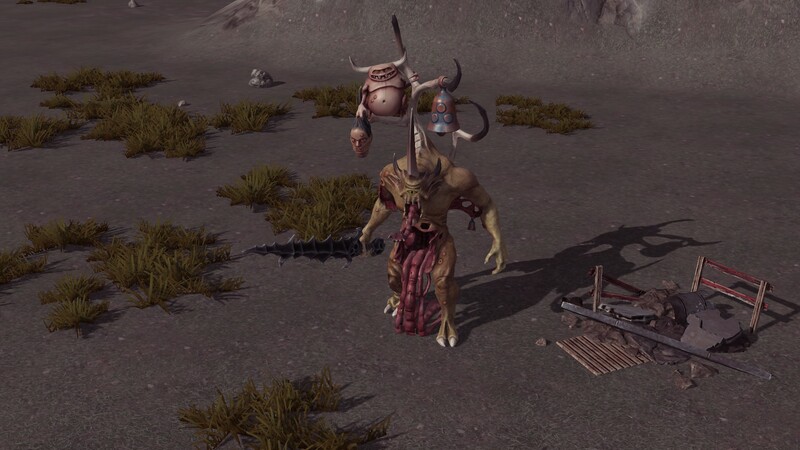 In Horrors of the Warp Plaguebearers are melee Infantry unit that has a chance to debuff enemies with every attack, removing actions and movement points. They are exceptionally sturdy, having an incredible amount of hit points, making them tough units to take down. The best unit to tear your enemies down in a battle of attrition. Poxbringers project an air of malign authority. They stand taller and broader than the Plaguebearers that surround them, their lumpen heads crowned with magnificent sets of rotting antlers. These daemons are the most common lieutenants of the Great Unclean Ones, who ensure their orders are carried out to the letter. Wielding their baleswords with prodigious strength, Poxbringers hack down the enemy’s champions and sorcerers while unleashing their own unclean spells to corrupt and despoil. In gameplay terms this vile champion of Chaos is capable of buffing other allied units as well as covering itself with its ability Cloud of Flies. Behold the power of Nurgle! High-ranking Plaguebearers are known amongst the Daemon legions as Plague Drones, a title that conveys commendable humility. These overseers of Nurgle’s realm ride into realspace mounted upon Rot Flies – colossal daemonic insects whose appearance is so repugnant it scars the mind. This devilish unit can be a tough opponent to defeat as it naturally regenerates its health every turn and can feed upon its enemies to further regain more health. Don't give it a chance to escape or it will fly away and come back at you later! Not devoted strictly to Nurgle but to all Chaos gods, making them an exception in this diary otherwise dedicated to papa Nurgle. Mind and will completely dissolved into blankness by the corrupting influence of Chaos, the Chaos Spawn lurch and stagger into battle with twisted limbs flailing. Dangerous and unpredictable, the only process left in their brain is the desire to kill - and they do so with a disturbing strength, lashing out at a horrified foe with unnatural strength. In Horrors of the Warp they are reasonably cheap single units making them an extremely dangerous unit that you can use to swarm your opponent!